Which Are Best Foldable Scooters Today? Which are Fastest Electric Scooters Today? We are on verge of revolution when it comes to personal transport. The big cities are “stuffed” with people, the air is getting stuffy, and unless we want to spend our lives stuck in traffic, we have to find another way of transportation. The automotive manufactures are turning to finding alternative sources of energy, producing more efficient, lighter and less expensive batteries, and even though the industry is progressing rapidly, we are still far from electric cars being ubiquitously available. Till that happens we still have our bikes, car sharing and public transport. But what people really want is a way to move themselves from one destination to another and keep the comfort, freedom and flexibility that owning a car offers. The electric scooters are the perfect answer to the trend of miniaturization, electrification, and personalization of urban transport. In big cities in Asia, for example, where the streets are overcrowded and there is almost no underground public transport, scooters dominate road traffic. Cars are just too big and cost too much, but offer little benefits. People that live in urban areas aren’t that keen on owning a car, they are in a search for a way of transport that’s convenient, cost effective and clean. If you live within a few miles of your workplace, and it’s just a little too far to walk, the electric bike or scooter is the perfect solution for you. By getting an e-scooter, you are taking a car of the road, you are reducing your carbon footprint, and not only helping your city, but also getting a chance at getting to know it a little bit better. 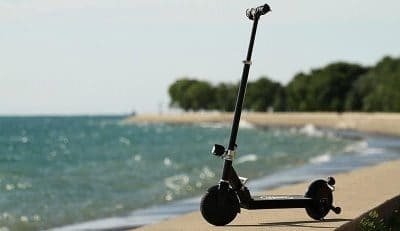 With the top speed about 20mph, and range between 15 miles and 25 miles the electric scooter can replace car, bus or train ride on all those short distance commutes. Electric scooters are simple to ride, and the learning curve is relatively easy, even for someone who has never ridden a two-wheeler before. No insurance, registration or license plates are required for most models, though it’s best to check regulations at your local DMV department. Wearing safety equipment like helmet is not only strongly recommended, but also required by law. Graduated from Carnegie Mellon University with a degree in Mechanical Engineering. A light electric vehicle enthusiast. At the age of 9, he built his first electric scooter from his sister’s kick scooter and his father’s cordless drill. He ruined both and was grounded for weeks, but the passion for DIY projects remained. Owner of a small bike shop in Colorado Springs. In his free time he enjoys tinkering with bike frames and batteries. He plans to travel around the world on an electric bike.